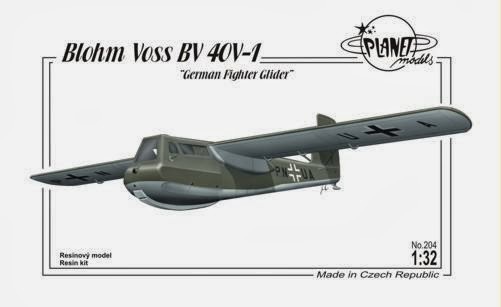 Blohm und Voss have long been associated with some of the more esoteric aircraft designs. Their asymmetrical BV 141 surely qualifies as one of the most outrageous vehicles that ever took to the air and has long been a favourite of modellers looking for something truly different. 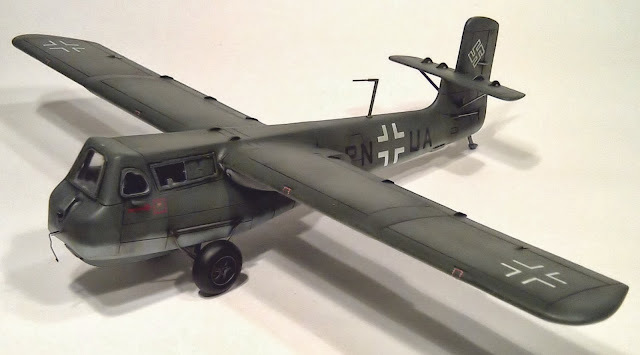 This particular aircraft, the BV 40V, is not particularly unusual in design, but it's intended use was intriguing and in line with many of the "last gasp" ideas to be commissioned by the Luftwaffe. I find these efforts fascinating. 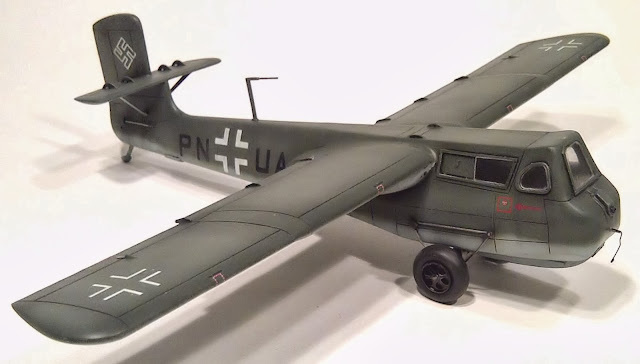 From mid 1944 onwards, materials and fuel were starting to become scarce and the German aircraft industry started to come up with some ingenious, if rather unusual, attempts to deal with this. The BV 40V was a glider designed to be towed in to the air on a drop trolley, by a Bf110 or similar.When well above the allied bomber formations, it was to be released and free dive down on to the enemy taking out as many as it could with two 20mm guns in the wing roots before it lost the height and would then land on it's belly skid. It was a tiny machine made largely from wood and fabric. It was little more than an enclosed hang glider in which the pilot would lie prone on his front, operating rudder controls at the back of the fuselage with his feet. Fortunately for the pilots (who unofficially considered it a suicide weapon), only seven prototypes were ever built and it never saw action. And so, on to the model. 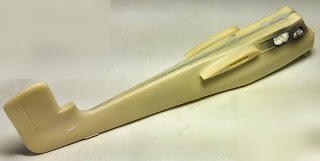 This kit from Planet Models is very nicely moulded in resin, some 25 parts and another 5 in clear resin for the windows. Test fitting of the major elements indicated that, after a little clean up, the fit was surprisingly good for a short run resin kit, and no obvious warping. 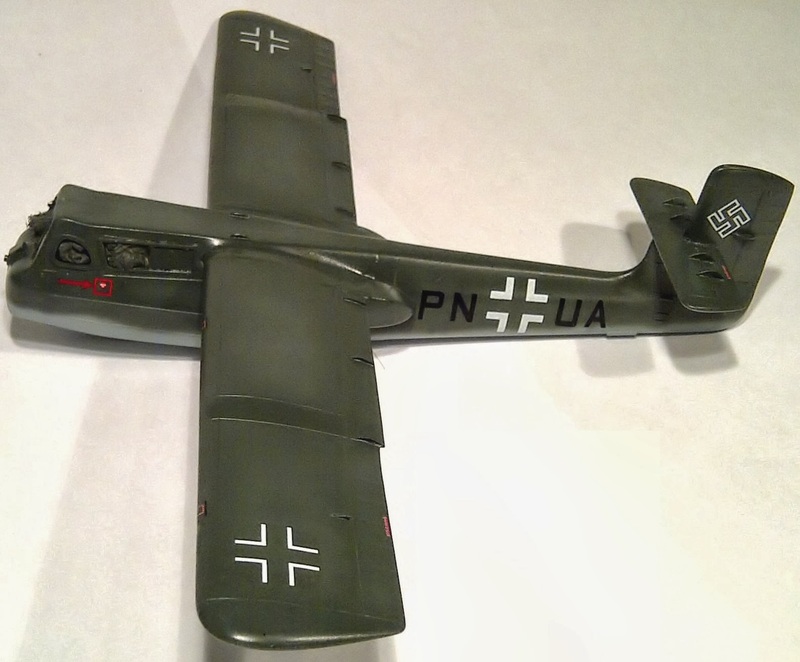 In terms of accuracy, first let me point out the references for this aircraft are limited and of dubious quality. This is not surprising given the small number of planes built. Available photographs are grainy and indistinct and published plans are of dubious provenance. 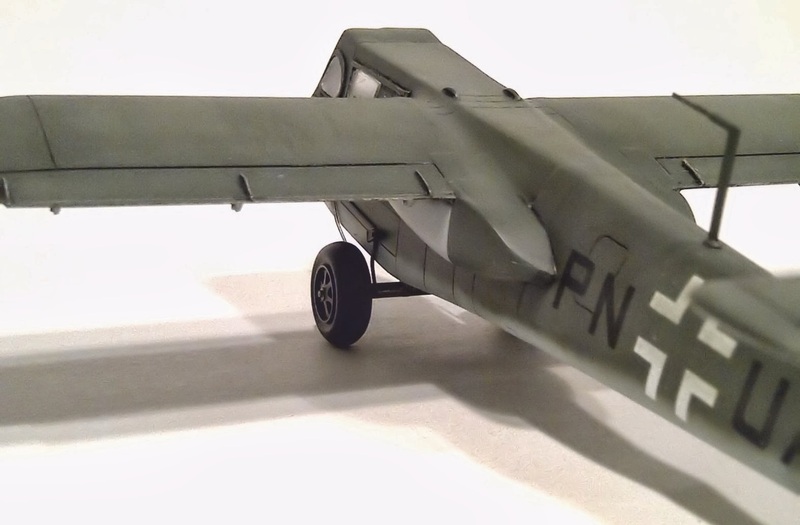 However I did establish that the raised part of the roof at the very front of the plane was possibly a little exaggerated, and that also you could argue that the nose was a little less rounded than it should be. However I did not consider either significant enough to require any correction, which would not be easy. I started with the internals, which are basic, consisting of a mat on which the pilot lies and a small number of dials and levers. There being no engine to worry about, the pilot at least had little to worry about in terms of controls. The levers are thinly moulded, which, whilst being realistic, meant that glueing them securely in place was a little tricky. I sprayed the entire interior with RLM66 dark grey before picking out the dials and details with a fine brush. The pilots mat was painted leather brown. I resisted the temptation to add too much in the way of extra details, as very little was going to be visible in the final model. But I did add some etched belts from my spares to the pilots mat. 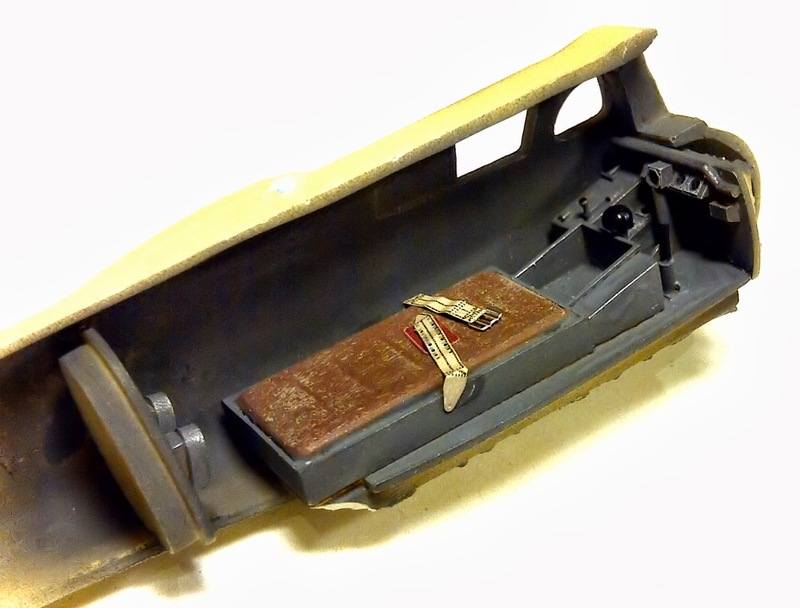 To my surprise and delight, the internal structure fitted perfectly inside the fuselage without much in the way of trimming and I closed up the fuselage halves with careful application of two part epoxy glue. This was left to set overnight, after which I spent some time de-seaming. Epoxy is great for securing the major elements of resin kits but it needs careful cleaning up afterwards and does not sand down well! The two main wing parts are nicely moulded as whole pieces (no separate flaps or ailerons) but there are separate, very nicely moulded, actuators for the control surfaces which really do look good. 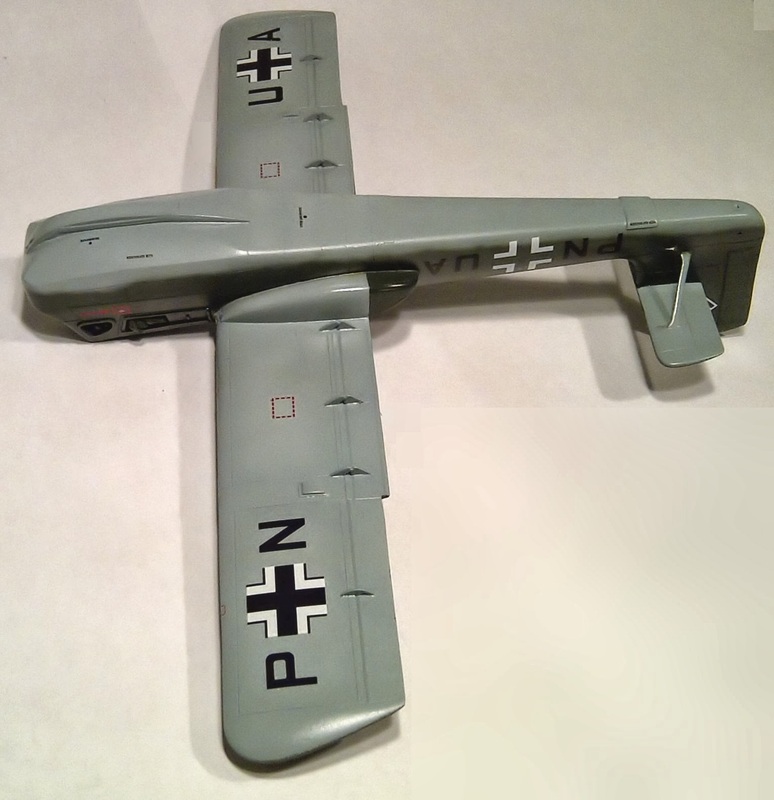 Also, and unusually for this type of kit, decent wing locating lugs are incorporated and although a little trimming was needed to get a decent and symmetrical fit, this meant that installing the wings was straightforward. Again, I used epoxy for strength. The single part tail plane was also attached at this stage and everything left overnight to cure. 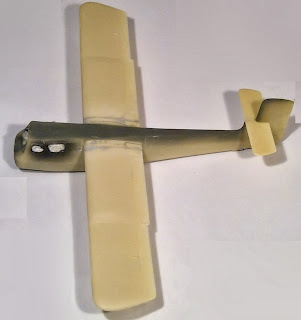 I did, however, have to insert a small sliver of plasticard to force the tailplane to sit straight. Also the tail struts took a little work to get in place correctly. They are also very thin so great care was needed to avoid then breaking. Next I installed the wing root gun housings. These are probably the poorest element of this kit. They did not fit particularly well and needed some re-shaping and plenty of filler. Also they do not actually have any gun ports on them. So before fixing them I drilled gun port holes that I would use to install gun barrels later. To add to the woes, they are not entirely symmetrical, one being very slightly larger at the rear than the other. However once installed this was not particularly noticeable. I left off the windscreen sections during painting as they can be installed from the outside. So I stuffed the cockpit full of wet tissue to avoid spray getting inside. The whole model was first primed with Tamiya fine primer which revealed as few flaws that needed some work with the sanding sticks. The underside was then sprayed with RLM 76. The instructions call for RLM 65 but later war models generally used 76 so I went with my judgement there. The undersides were then masked off with Tamiya tape and the whole topside sprayed RLM 70. After removing the masks I softened the demarcation with careful airbrushing. Next I used lightened versions of the two paint tones to fade the panel areas and provided some cross hatching to represent the fabric on the wooden frame. After a couple of coats of gloss varnish, I placed the decals. The ones provided in the kit (representing one of the prototype machines PN+UA) are well printed but very thin. This is great for the final result but they can be very frustrating to install. I suffered near disaster with a couple of the letters that folded over and split but fortunately managed to recover the situation. No stencilling is provided (not that much is necessary) but I could not resist raiding my decals spare draw for some additional markings that I gleaned and guessed as best I could from the scant reference material available. After another gloss coat I applied a black oil paint panel line wash which settled in to the panel lines nicely. This was followed by a dull satin coat for the final finish. I the also added some weak oil wash to the fuselage and tail side to represent water runs. I felt these were necessary if only to add a little interest to an otherwise rather plain camouflage scheme. At this point I also installed the windscreen parts. These are a little thick and not terribly clear, and I was unable to improve matters with the "dipping in Klear" technique. Also, they do not fit terribly well, with some gaps which I had to fill with PVA. But the interior is not particularly visible even without them so no matter. Now I added a few extra details. The overwing and tail actuator cables were replicated with steel wire. I also added the gun barrels from spares, although I pushed them completely in to the housings as there was no evidence in reference photos of the guns protruding. I also added, using fuse wire, the nose hook which is a prominent feature. 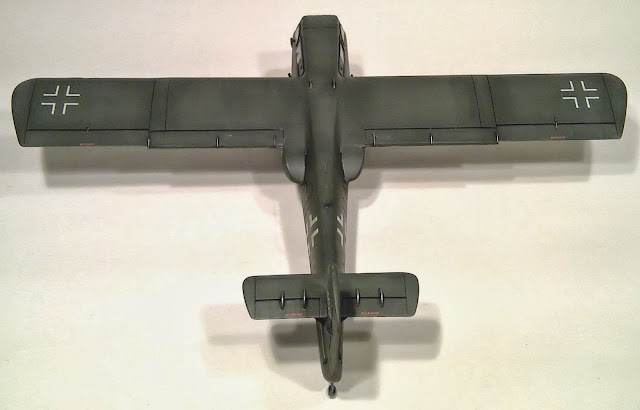 I toyed with the idea of scratch building the wing fenders that appear on many diagrams of this plane, however I could find no photographic evidence of them so I left them out. The final exercise was to put the wheel trolley in place. 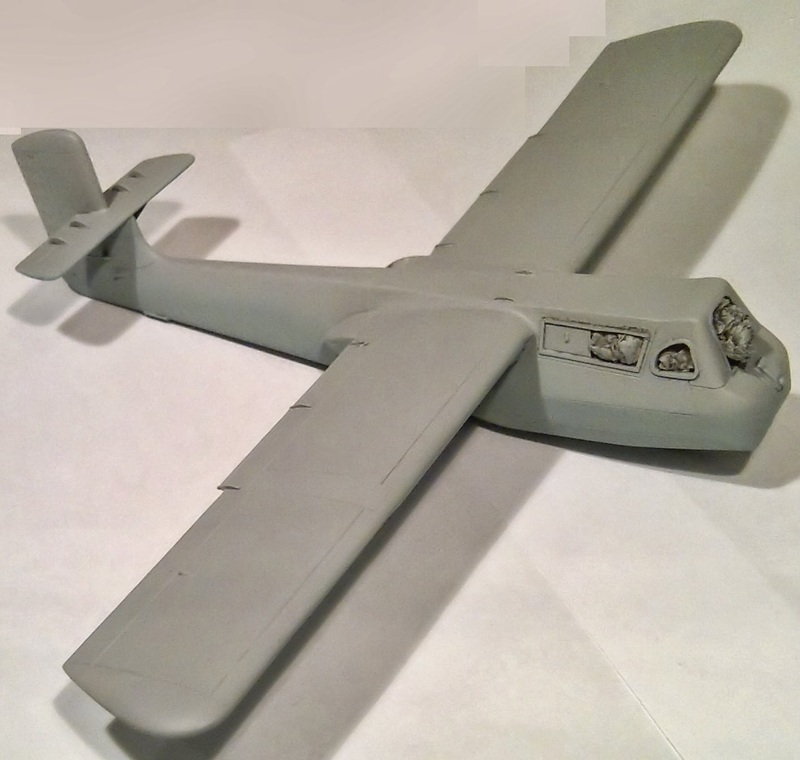 The kit provide a basic wheel axle which fits to the belly skid. It is basic and probably not completely accurate but being underneath I left it as is. The wheels themselves are very nicely moulded in the best tradition of resin wheels. I painted these up and fixed them to the axle. 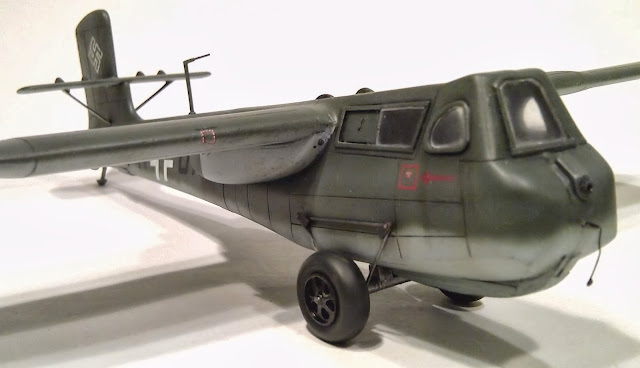 The kit does not, rather annoyingly, provide the struts for the trolley (only the fixing points to the fuselage) and advises that they should be scratch built from wire. 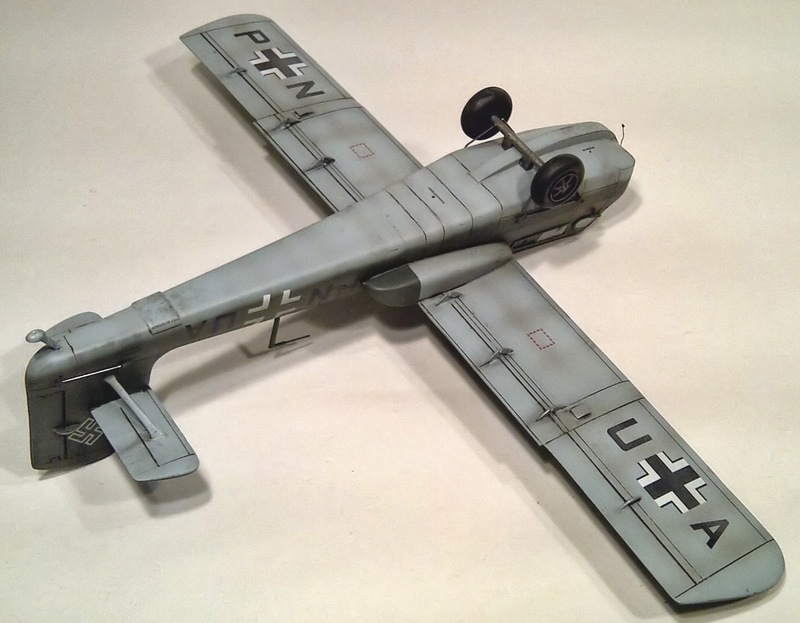 I opted to use thin styrene rod which is much easier to work with and certainly looked the part when painted up with Tamiya XF-56 metallic grey. This is, by the way, one of my favourite paints from their range. It serves very well whenever a steel effect is required, especially when dry brushed with a little silver. And that was it! This is certainly one of the most enjoyable resin kits I have built for a very long time. It is very well engineered for this type of kit and builds to a very nice representation of this unusual aircraft. Enjoy!